The snow leopard (Panthera uncia) is a rare big cat adapted to life in a cold, harsh environment. Its patterned coat helps it blend in with the steep rocky slopes above the tree line in the Asian mountains. The other name for the snow leopard is the "ounce." Ounce and the species name uncia derive from the old French word once, which means "lynx." While the snow leopard is close in size to a lynx, it is more closely related to the jaguar, leopard, and tiger. Fun Fact: Snow leopards are the least aggressive of the big cats. They do not attack humans, even when threatened. The snow leopard has several physical characteristics that are adapted to its environment. These traits also distinguish the snow leopard from other big cats. The snow leopard's fur camouflages the cat against rocky terrain and protects it from cold temperatures. The dense fur is white on the snow leopard's belly, gray on its head, and dotted with black rosettes. Thick fur also covers the cat's large paws, helping to grip slick surfaces and minimize heat loss. The snow leopard has short legs, a stocky body, and an extremely long, bushy tail, which it can curl over its face to stay warm. Its short muzzle and small ears also help the animal conserve heat. While other big cats have golden eyes, the snow leopard's eyes are gray or green. Also unlike other big cats, the snow leopard cannot roar. It communicates using mews, growls, chuffing, hisses, and wails. Male snow leopards are larger than females, but they have a similar appearance. On average, a snow leopard's length is between 75 and 150 cm (30 to 59 in), plus a tail that's 80 to 105 cm (31 to 41 in) long. The average snow leopard weighs between 22 and 55 kg (49 to 121 lb). A large male may reach 75 kg (165 lb), while a small female may weigh under 25 kg (55 lb). Snow leopards live at high elevations in mountainous regions of Central Asia. Countries include Russia, Kazakhstan, Kyrgyzstan, Tajikistan, Uzbekistan, Afghanistan, Pakistan, India, Nepal, Bhutan, Mongolia, and Tibet. In the summer, the snow leopards live above the tree line from 2,700 to 6,000 m (8,900 to 19,700 ft), but in the winter they descend to forests between 1,200 and 2,000 m (3,900 to 6,600 ft). While they are adapted to traverse rocky terrain and snow, snow leopards will follow trails made by people and animals if they are available. Snow leopards are carnivores that actively hunt prey, including Himalayan blue sheep, tahr, argali, markor, deer, monkeys, birds, young camels and horses, marmots, pikas, and voles. Essentially, snow leopards will eat any animal that's two to four times their own weight or less. They also eat grass, twigs, and other vegetation. 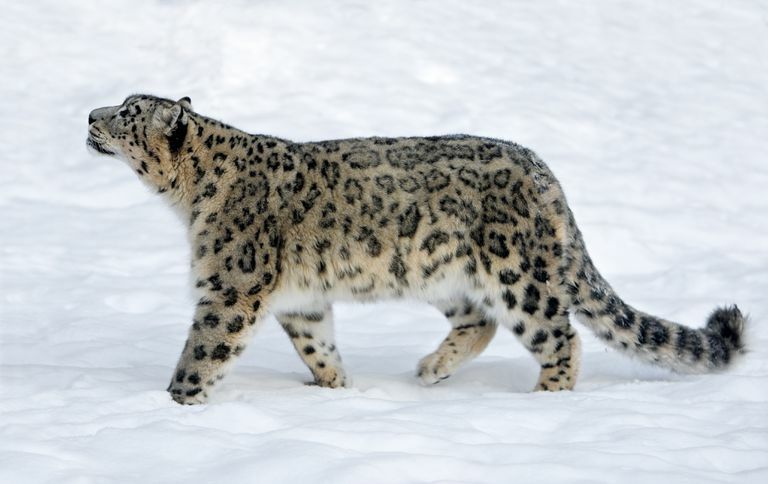 Snow leopards do not hunt adult yaks or humans. Usually they are solitary, but pairs have been known to hunt together. As an apex predator, adult snow leopards are not hunted by other animals. Cubs may be eaten by birds of prey, but only humans hunt the adult cats. Snow leopards become sexually mature between two and three years of age, and they mate in late winter. The female finds a rocky den, which she lines with fur from her belly. After a 90-100 day gestation, she gives birth to one to five black-spotted cubs. Like domestic kittens, snow leopard cubs are blind at birth. Snow leopards are weaned by 10 weeks of age and remain with their mother for up to 18-22 months. At that point, the young cats travel great distances to seek their new home. Scientists believe this trait naturally reduces the chance of inbreeding. In the wild, most cats live between 15 and 18 years, but snow leopards live about 25 years in captivity. The snow leopard was on the endangered species list from 1972 until 2017. The IUCN Red List now categorizes the snow leopard as a vulnerable species. The change reflected an improved grasp of the reclusive cat's true population, rather than an increase in numbers. An assessment in 2016 estimated a population between 2,710 to 3,386 mature individuals remaining in the wild, with a decreasing population trend. An additional 600 snow leopards live in captivity. While they aren't aggressive toward humans, snow leopards do not make good pets because they require considerable space and raw meat, and males spray to mark territory. While snow leopards are protected over part of their range, hunting and poaching pose a major threat to their survival. The snow leopard is hunted for its fur and body parts and killed to protect livestock. Humans also hunt the snow leopard's prey, forcing the animal to encroach on human settlements to find food. Habitat loss is another significant threat to the snow leopard. 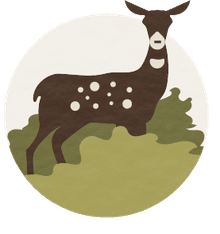 Commercial and residential development reduces the available habitat. Global warming increases the altitude of the tree line, diminishing the range of the cat and its prey. Boitani, L. (1984). Simon & Schuster's Guide to Mammals. Simon & Schuster, Touchstone Books. ISBN 978-0-671-42805-1. Nyhus, P.; McCarthy, T.; Mallon, D. (2016). Snow Leopards. Biodiversity of the World: Conservation from Genes to Landscapes. London, Oxford, Boston, New York, San Diego: Academic Press.